12. 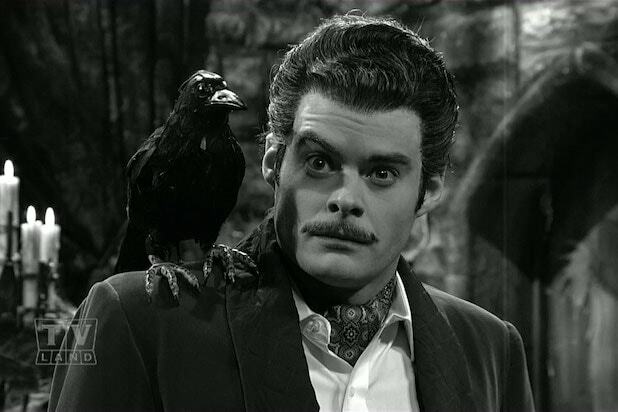 Vincent Price Hader’s Price is likely as good as anyone’s (though he told Marc Maron on "WTF" that he was inspired by stand-up comedian Dana Gould), but “SNL” never really knew what to do with it. He looks hilarious with a perpetually arched eyebrow and an obviously stuffed crow sitting on his shoulder, but then the rest of the cast could never do Old Hollywood figures as well as he could. 11. Herb Welch The real joke of Hader’s absent minded, curmudgeonly reporter Herb Welch is how he hits everyone in the mouth with the microphone. Hader makes it seem involuntary. It gets old, especially when each sketch ends with Welch sprouting back to life, but they’re worth it just to see Welch find a new way to berate Jason Sudeikis. 10. Lindsey Buckingham All he ever did during Kenan Thompson’s “What Up With That” sketches was sit there, wave, nod and smile as the "Fleetwood Mac" guitarist-singer. It produced plenty of choice gifs, so we’re glad he’s such a good sport. 9. Birdman “It’s pronounced Berdman.” “Bidmen.” “Bi-mn.” This hilarious mystical Aussie is weird even by “Portlandia” standards. 8. Vinny Vedecci As Pete Holmes once joked, doing a thick Italian accent is literally the last socially tolerated stereotype. But, of course, Vinny Vedecci isn’t just Hader doing an accent. He’s brimming with charm even as he smokes a thousand cigarettes and condescends to everyone from Robert De Niro to Seth Rogen. 7. Anthony Scaramucci Hader was destined to play Scaramucci. His over-the-top New Yorker isn’t really an “impression,” but Hader is a better Mooch than even The Mooch himself. 6. Parker Gail Hader gives a masterclass performance in this pitch-perfect homage to Spalding Gray during an episode of “Documentary Now!” Hader’s one-man-show might be more captivating than funny, but there aren’t many comedic actors who can show this much dynamic range. 5. James Carville It’s hard to top James Carville doing his “cajun style” self on “30 Rock,” but Hader nails the political commentator's exaggerated sniggering and was crazy enough that the writers could sneak in some pretty ruthless Rush Limbaugh fat jokes. He takes this character one step further when he does a version of Carville in a great "Documentary Now" parody of "The War Room." 4. Jerry Wallach Hader first experimented with this character as “The President of Hollywood” during the Comedy Central Roast of James Franco. His baritone glad-handing in a bright red ‘80s track suit killed. 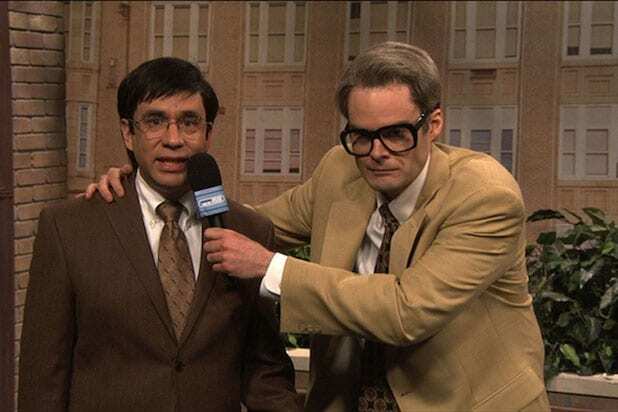 So he brought a version of it back for the Season 2 finale of “Documentary Now!” It goes to show how lived-in and complex each of Hader’s characters are. It’s not a send up of one person in particular (namely producer Robert Evans) but feels like a portrait of every cliche Hollywood producer this industry has known for decades. 3. Keith Morrison What a hilarious creep Hader’s Keith Morrison is on "Saturday Night Live." His sinister smile, his scintillating oohing and aahing; it’s a wonderful way of satirizing the idea that some people get sadistic pleasure from their own trash TV. 1. Stefon Yes yes yes yes yes. The genius of Stefon can’t be summed up with one thing. He’s got everything: the ridiculous green shirt, the sexually explicit puns, the absurd clubs named after nonsense words, those gleefully offensive things he does to “midgets” (his word, not ours). Most “Weekend Update” characters just have ONE joke good enough to run into the ground. Stefon’s been back more than a dozen times and always finds new, inappropriate nightlife recommendations. He’s a complex enough character that you can imagine him getting married to Seth Meyers. 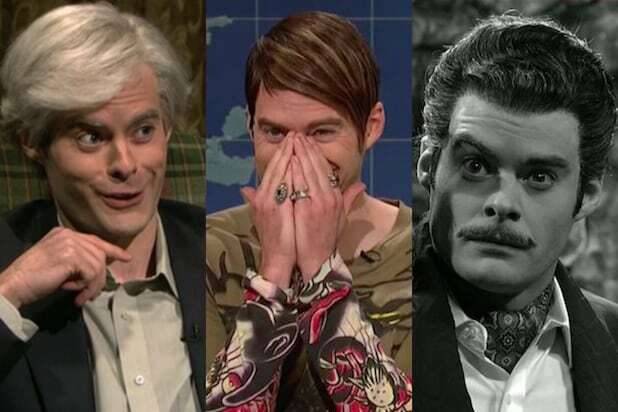 Stefon’s hands over his mouth may just be to hide Hader’s giggling, but it’s made Stefon forever endearing.